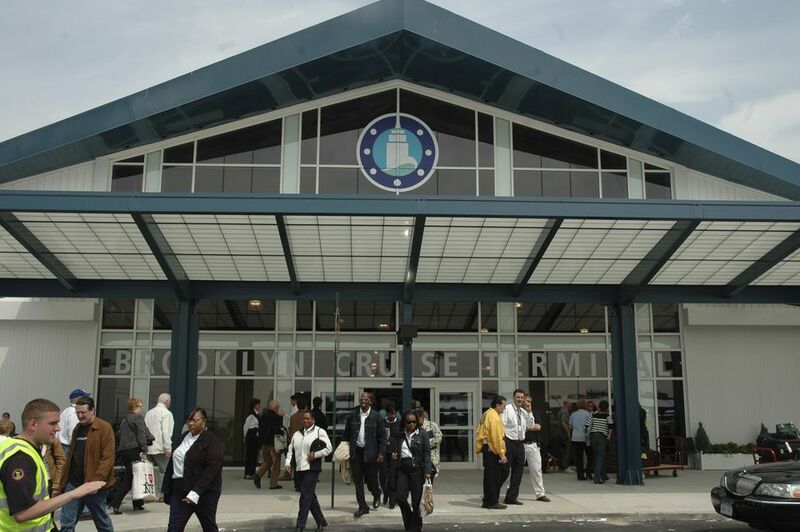 Located at Pier 12 in the Red Hook neighborhood of Brooklyn, the Brooklyn Cruise Terminal opened in 2006 with one cruise quay handling nearly 50 cruise ships and 250,000 passengers annually. There are two main cruise lines operating out of the Brooklyn Cruise Terminal: Cunard and Princess. Cunard's Queen Mary 2 offers transatlantic cruises that either start or end in Brooklyn, while Princess offers fall foliage itineraries to Canada/New England and the Caribbean/Mexico. The closest airport to the Brooklyn Cruise terminal is LaGuardia, but it's easy to get to the terminal from any of the three major NYC airports (LGA/JFK/EWR). We recommend allowing at least two hours to travel from the airport to the cruise terminal (a bit more if you're flying into Newark), plus additional time if you're traveling during rush hour. The Brooklyn Cruise Terminal has plenty of parking available, both short-term and long-term, and there is no need to reserve in advance. If you're driving to the terminal, put this address in your GPS: 72 Bowne, Street Brooklyn, NY 11231. Most cruise lines will offer shuttle service to the cruise terminal, but if you're traveling with a group you might find it more cost effective to take a cab. The neighborhood is not well served by subways. All options to travel to the cruise terminal require changing to a bus and walking 4+ blocks, so we don't suggest public transportation as the best way to get to the cruise terminal. The closest hotel to the Brooklyn Cruise Terminal is the Comfort Inn Brooklyn Cruise Terminal. The Nu Hotel, New York Marriott at the Brooklyn Bridge, and Aloft Hotel are all located in Downtown Brooklyn, a short cab ride away from the terminal. Hotels in midtown and downtown Manhattan are less than 30 minutes from the cruise terminal by cab, making them good choices if you want to explore Manhattan before your cruise departs. Baked is a perfect choice for an early morning treat or coffee. Hope and Anchor serves upscale diner food and breakfast all day. The Good Fork is practically a neighborhood institution. If you've got time, you can't beat its delicious dinner and brunch. From the cruise terminal, you can get a good view of the Statue of Liberty in the New York harbor and of the Manhattan skyline. The area immediately around the cruise terminal doesn't have much to offer visitors, but a short cab ride can bring you to many of Brooklyn's great attractions. If you're looking for a fun area to walk around, shop, and have a meal, you might enjoy Smith Street in the Boerum Hill/Cobble Hill/Carroll Gardens neighborhood, which has numerous restaurants, shops, and more. On the other hand, if you're a sports fan arriving in town a few days prior to your departure, you might want to swing by the new Barclays Center to catch a game or a watch show before setting sail.